Here in the Pacific Northwest, the weather has cooled, there is a chill in the air and my need for cozy and warm accessories are in high priority. When I was visiting a JOANN store in Utah, I saw some yarn that immediately caught my attention and I just KNEW I needed to make something with it. After trial after trial, I finally decided my new skeins of Wool and the Gang Cuddle Me Softly yarn was asking to be transformed into a squishy, cozy and delicious scarf to wrap up in. If you haven’t seen this yarn before, Wool and the Gang Cuddle Me Softly is so soft, so squishy and so delicious. Though it may not come in many colors, the colors that it does come in sure speak to my creativity. I had such a hard time deciding what colors to choose! 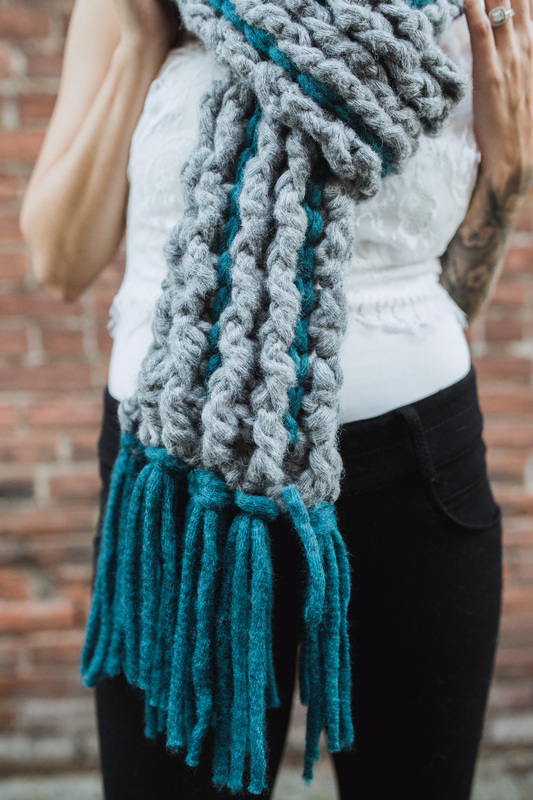 For this scarf, I’ve decided to use both Storm Gray and Jewel Green (though it’s not green at all, it’s more of a sapphire color in real life). The fiber content for this yarn is a scrumptious 89% acrylic and 11% polyamide and when feeling it, it reminds me of a roving except it is enclosed in a sort of “net” keeping it from coming apart. It really is a quality product! 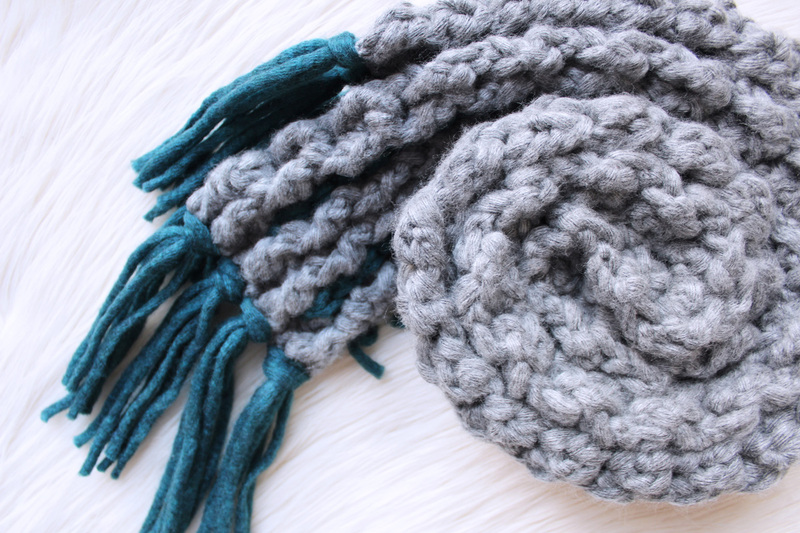 Texture, cozy fibers and fringe.. what more could you ask for?! 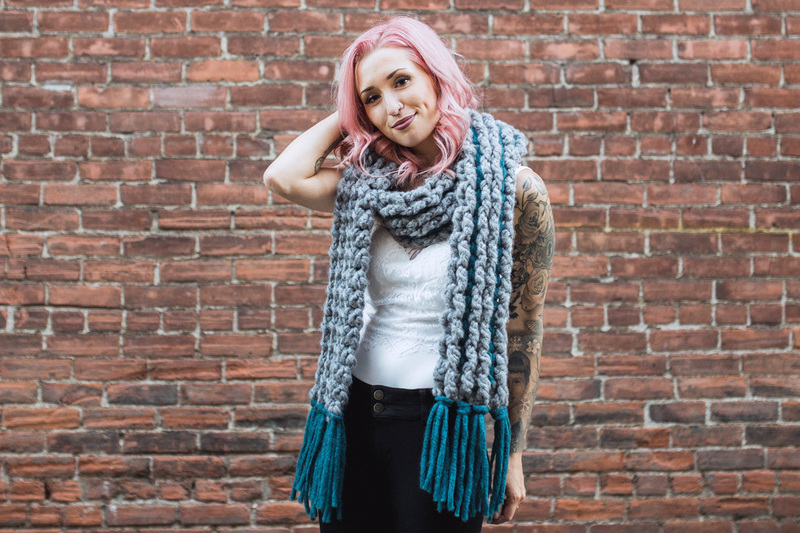 The Ellamae Fringe Scarf is quick to work up, squishy to wear and a trendy way to stay warm during the cooler months. 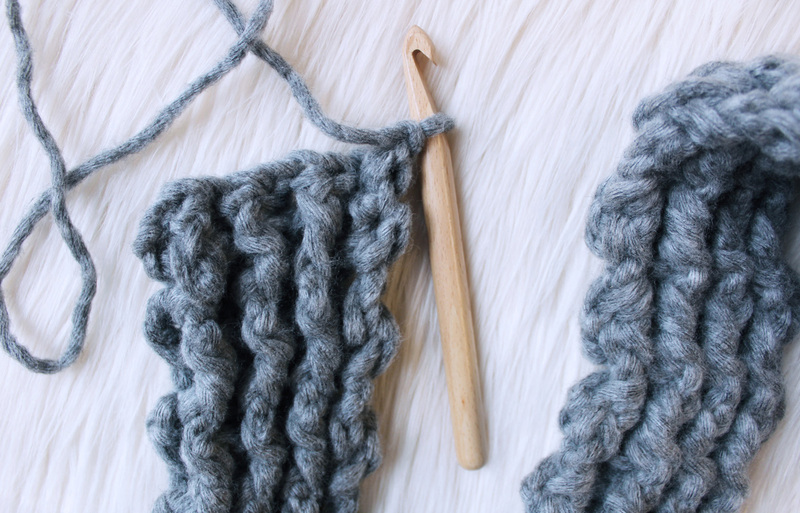 Pick up your hook and let’s get started on a fun and quick project! At the beginning of each row, CH 1 does not count as a stitch. First we will be creating the entire body of the scarf using Color A, as per the pattern. After we complete the body, we will weave in our ends before we move to the next step. 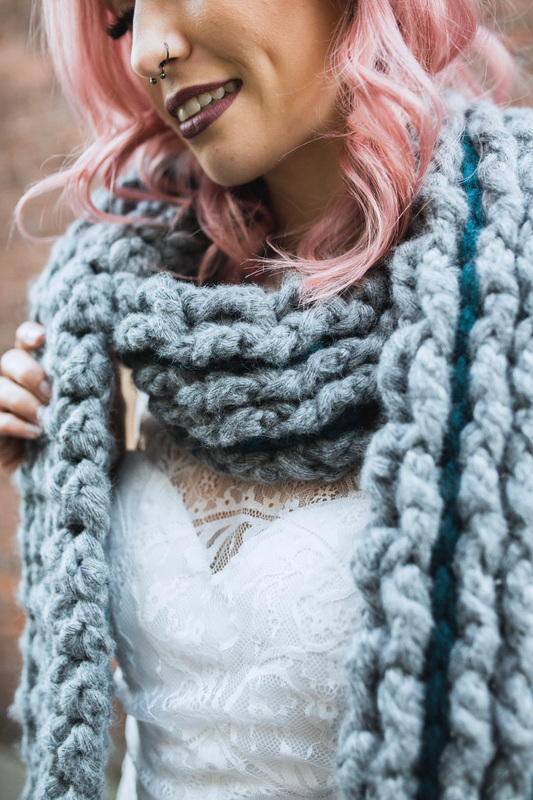 Using surface slip sts, we will add our Color B detailing along the length of the scarf in three places. Lastly, we will create and attach the fringe using Color B as well. 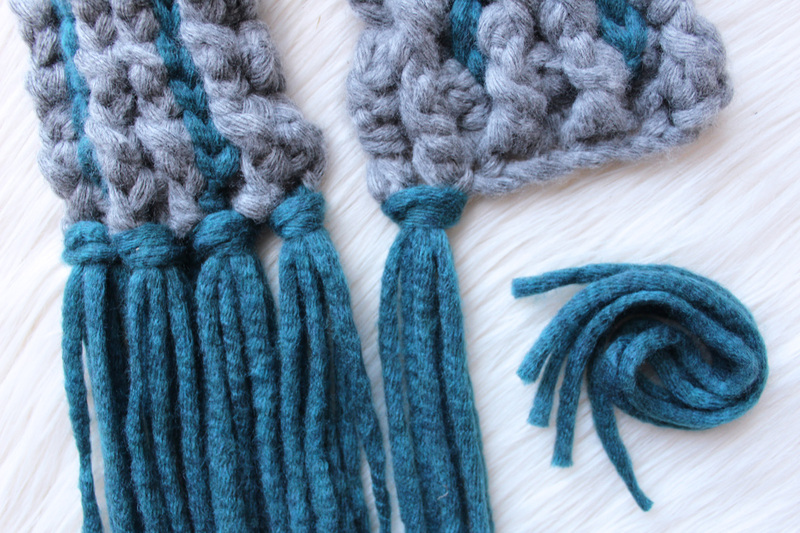 To add a new skein to an in-progress project, you may do the version that works best for you. I generally just tie the ends together, leaving about 4-6” tails for each strand to weave in later. This allows for seamless and continual making time! Using Color A, CH 9. Repeat Step 2 until your piece measures 84” long. We will be using Color B for this step. Create slipknot. 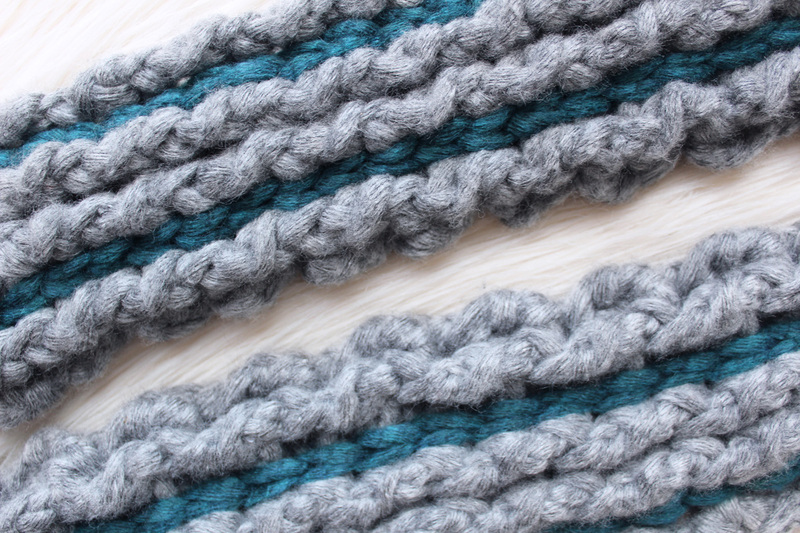 Starting at the end of the scarf, insert hook into edge of scarf, in between ridges. With the hook inserted, attach Color B slipknot onto hook, yarn over, pull hook back through. You will have two loops on your hook. Sl St these two loops. (Note: Your working strand will remain on the wrong side of your work. Do not pull working strand to front.) Insert hook into next st sp, yarn over, pull back through. Sl St two loops on hook. 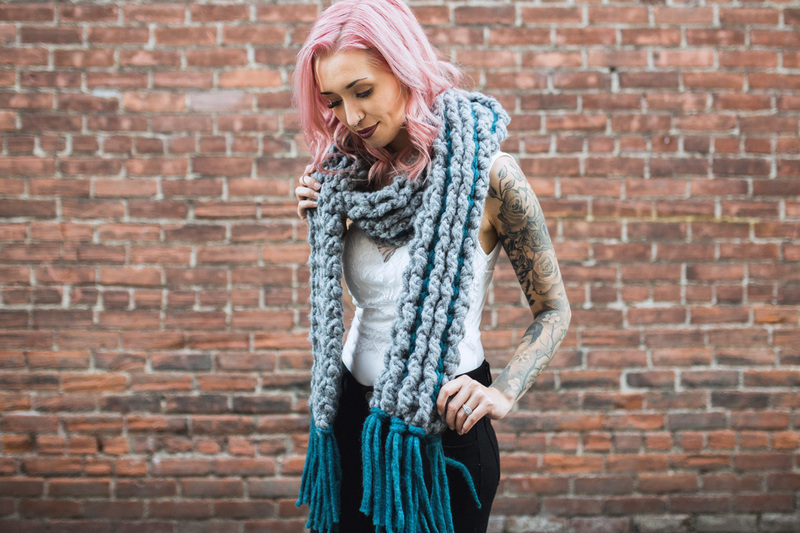 Repeat for the length of the scarf. Finish off, weave in ends. Repeat Step 1 for other side of scarf, keeping Sl St design on the same side. 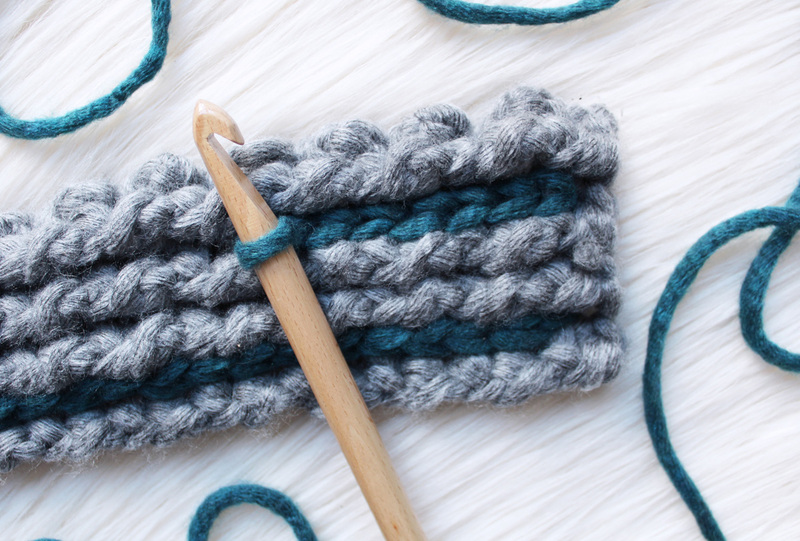 OPTIONAL: You can check out this great tutorial by Bhooked for how to do surface slip stitches if you have never done this before. I’ve also included the video at the bottom this post for easy access. See below. We will be using Color B for this step. First, cut 24 strips of Color B yarn with each strip measuring 17”. Separate the 24 strips into groups of three. Each group will be used for one fringe section. Fold first group in half. Slip the center/folded part of the group through the corner section of one end of the scarf - do not pull all the way through. With the folded section exposed through the other side of the scarf, grab the tails and pull through the loop that was created. Pull gently to set into place. Repeat for each group, placing four groups on each end of the scarf. 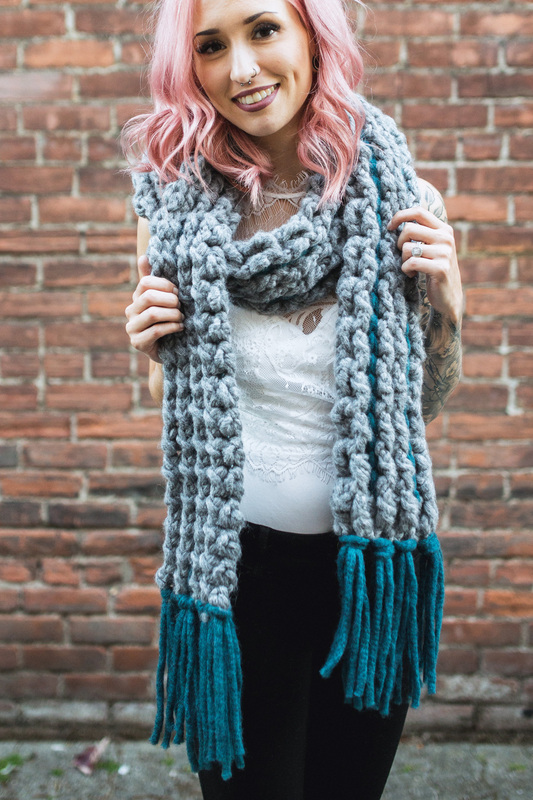 Remember, you can get a downloadable, printer-friendly version of the Ellamae Fringe Scarf crochet pattern on Etsy, Ravelry, and Love Crochet! Thank you for supporting me!! Don't forget to get your Wool and the Gang Cuddle Me Softly yarn at your local JOANN store or on their website! Share your progress online and use hashtags #handmadewithjoann and #thehooknookers so share with our communities! Be sure to follow along with me on Instagram to see more fun inspiration and stay in the loop with whats to come! Thank you to my friends at JOANN Stores for helping me create such a fun project!